Many festivals are celebrated throughout the year by different religious groups. As per tradition there are thirteen festivals in twelve months. Amongst all the festivals the car festival of Lord Jagannath is the biggest which is held at Puri. The car festival is celebrated in the month of July every year. In past the car festival was observed only at Puri. But now it has become a common festival. Temples of Lord Jagannath have been built in many places. Even the car festival is celebrated at America and Russia also. 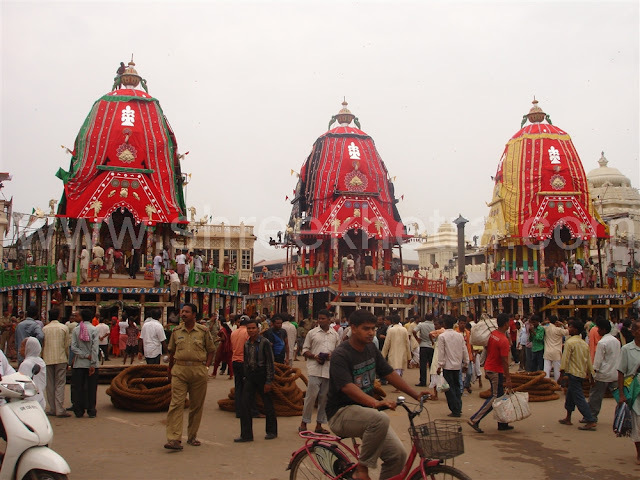 People come to Puri in lacs to have a darshan of the Lord Jagannath, his elder brother Balabhadra and . sister Subhadra on the cars. Puri becomes over crowded on this eve. Hotels and lodgings are booked earlier. The three deities are brought from the temple and placed on three wooden chariots. Most experienced carpenters build these chariots. The piligrims pull the chariots by the strings tied to them. All are with full devotion of heart for the deities. Sounds of prayers, chantings, brass bands, clappings and musical instruments make a great noise. The deities reach the Gundicha House pulled by the people and stay there for nine days. On the tenth day the return car festival is observed. People pull the chariots to the main temple. The deities are placed on their shrines again. The car festival is the greatest festival of Hindus. Everyone desires to see it once in life at Puri.